A search engine is available at the top right corner of the page . Please note that all the fields are searched (author, editor, abstract in the original language, etc.). Depending on the type of publication, the “creator” column contains either the name(s) of the author(s) or the name(s) of the editor(s). You can select which fields you want to display (publication type, publisher, etc.) on the results page by pressing the “Library Settings” button . 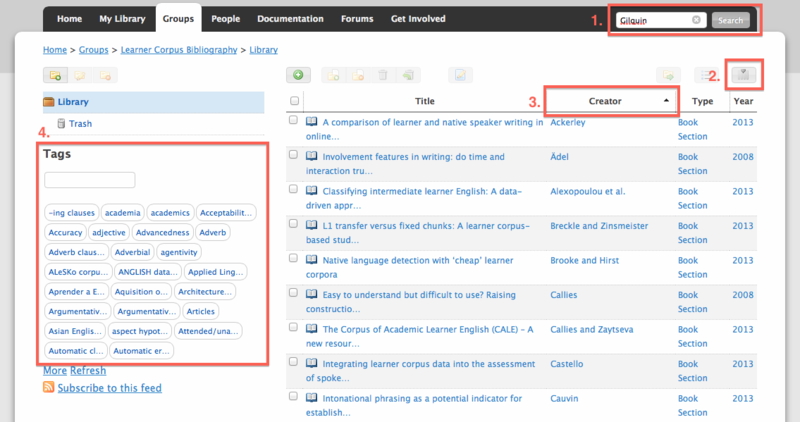 Click on the title of a column  to change the sorting order (descending or ascending). You may find it useful to reorganize the results by type of publication. You can also narrow down your research by selecting one or more co-occurring tag(s) on the left side of the screen .